In spite of 4 July weekends that included either the start or end of a nor'easter, there have been some fish caught. It generally has not been very good fishing, but at times it has been exceptional. The problem has come in trying to figure out the differences between the two extremes. My advice is to avoid the full moon and look for the strongest periods in the Solunar Tables. Even then a hip pocket full of good luck is the best bait to bring. With a little luck, the weather will return to a more normal pattern soon and the fishing will respond with it. Red drum are still the number one player here. Keep a sharp eye out for spotted tails along marsh edges, oyster bars, and grassy flats. On high tides and especially the full moon high tides, they will often move up into the flooded marsh grass, searching for the crabs, shrimp, and minnows that usually hide there. Top water plugs, gold spoons, and an assortment of plastics will help you make quick contact. Remember, only 1 red drum per day between 18 and 27 inches may be kept. It doesn't hurt to release them all. Around Manteo and Manns Harbor, there have been enough hungry stripers around to keep fishermen smiling. Favorite spots have been around the bridges. This is catch and release fishing only---don't keep one. Some fairly good striper reports are also coming from Belhaven, Washington, and New Bern. These aren't big fish, just hungry smaller ones. Check the regulations before you go, but generally in these areas you can keep 3, with a minimum length of 18 inches. To the south, flounder fishing is getting better. There have been some very good catches of flounder in the Morehead City, Swansboro, Carolina Beach and Southport areas. There doesn't seem to be as many 10 pounders as most years, but there are a fair number of 4 to 6 pounders. Especially in the Eastern Pamlico Sound and Hatteras areas, a few fishermen are still catching some speckled trout. They can be pretty finicky and hard to find in this heat. Very early mornings and late afternoons are usually the times when the trout are most active. While many soft plastics and topwater baits are working to some degree, live shrimp get their appetites fired up best. Several times already this summer there have been some kings caught at the NC State Ports Dock in Morehead City. There also have been several caught right in Beaufort Inlet and the Cape Fear River Inlet. It's happened before and it will happen again. Things are slow on the piers right now, but when the wind blows from the southwest and muddies up the water, the bottom fishing part of pier fishing appears to be better. Some summer spots, flounder, sea mullet (whiting), bluefish, pompano, a few black and red drum, blowfish, sharks, and skates are making up the bulk of the catch. There are some spanish mackerel around, but generally they prefer those days when the water is clean. Even then, the best time is usually early morning or late afternoon. With the onslaught of the "Dog Days of Summer" king fishing from the piers has slowed quite a bit. Every day, more baitfish are moving along the beaches, so it is just a matter of WHEN that action will pick back up. There have been lots of hungry jack crevalle prowling the beaches and they have tried to take the place of the kings. The occasional tarpon is still thrilling the pier enders along much of the coast. While the bluefish have slowed down some, there are still lots of spanish mackerel along most of the NC coast. These spanish mackerel and bluefish are hitting a variety of trolled spoons and casting lures. If you are having trouble catching them, check out the Central NC Coast Regional Report in the July Carolina Adventure Magazine. There are some good tips to catch spanish when they get finicky. The bottom line is to downsize your tackle and lures when the spanish get finicky. Just like on the piers, the king fishing in nearshore waters has slowed dramatically. The king mack attack of several weeks ago has all but disappeared. I am certain that there are still some kings near the beach, but the combination of summer northeast winds, cooler days, and several other factors we don't understand have just given them temporary lockjaw. They will break loose again soon and with a vengeance. 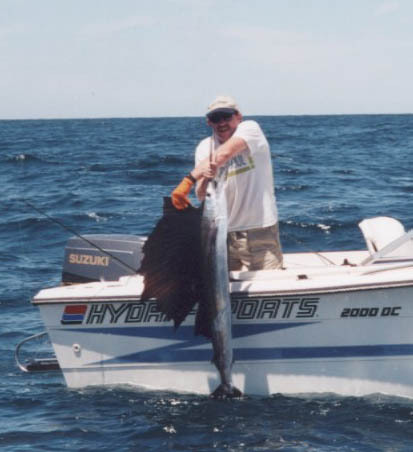 Bottom bouncers have been doing well with sea bass, grunts, snapper and a few grouper. Right now this might be the best area to look for a limit of kings. They aren't everywhere, but there are still some concentrations of small to medium size kings in these depths. A few big ones will probably be mixed in also. The smaller dolphin have moved in here in good numbers also. Anchoring or drifting, with a light line out the back could add a king or dolphin to your bottomfish catch. Don't be surprised to find a wildly jumping sailfish on the business end of your line either. They have been surprising quite a few fishermen in this depth range. There are still some yellowfin tuna being caught along the coast, with the best catches being from the Big Rock to the north. However, dolphin are outnumbering them in most catches. There are a pretty good number of gaffer dolphin too, including some really big ones. A wahoo or two are also present in many catches and sometimes even a king or two. The Point, south of Oregon Inlet, has been holding some nice bigeye tuna for several weeks now. Many of these fish are in the 100 pound range or over and will test even the heaviest tackle. With the heat of the summer, billfish encounters will rise and fall with the moon phases. They will occasionally put some real excitement in your offshore adventures. The billfish numbers should moderate for another several weeks and then peak with the annual white marlin blitz around the September full moon. There is still no word yet on the two blackfin tuna catches that have been submitted to the NCDMF as a potential state record. The certification process involves pictures, positive identification, certified scale verification, and more paperwork, which is not yet complete on either. One is a 36 pound fish that was caught on the Musicman charterboat, out of Carolina Beach. The other is a 37 pound fish that was caught on the Harper's Folly charterboat, out of Hatteras. As soon as one of them is certified, I will post it here.